A lot of us have been thinking about Muhammad Ali since we learned he died last week. Ali wasn’t, of course, primarily known for things automotive, but there are some good stories there, including this one, about the boxer and a car powered by a boxer motor. That boxer motor was the famous Volkswagen Type I motor, best known for powering millions and millions of Beetles all over the world. It was also used by the Brazilian automaker Puma to power their sleek little fiberglass sports cars, among innumerable other things. Puma was one of the bigger makers of fiberglass VW-based cars in Brazil, and they made some very appealing little sports cars, initially inspired by the design of the Lamborghini Miura, which is a great place to start. Puma was undergoing a corporate move and transition in 1986, but they still had a representative in Texas, a guy named Kevin Haines who just also happened to be a friend of a man who floated like a butterfly and stung like a bee: then-retired boxer Muhammad Ali. Haines convinced Ali to invest in Puma, and even beyond just investing, Muhammad Ali had a plan to branch out sales as well: Ali was brokering a deal with Sheik Al Fassi of Saudi Arabia to order 400 (some sources say 440, one says 1,440) special editions of the Puma P-108 convertible, to be called the Puma Al Fassi, and sold throughout the Middle East. This is the part where the “lettuce” nickname comes in: the name “Al Fassi” in Portuguese sounds a lot like the word alface, which means “lettuce.” So, yeah. Lettuce. “I drive a bright red Lettuce.” I guess that could be cool, as long as, you know, you don’t park next to a Rabbit. Two prototypes were built (along with a body for a third) around 1988-1989. Aside from the big “Al Fassi” badge on the rear, and the with smaller badges on the quarter panels, the Al Fassi Puma differed from the ‘normal’ Puma P-108 in a few key ways: it was widened, the headlight design was tweaked (square sealed beams instead of round), the dash and interior materials were upgraded with wood and a general attempt was made to bring it up to European sports car standards. Oh, also, it had cool round door handles that I think came from a Fiat Ritmo. The prototypes had the usual rear-mounted 1600cc VW engine with twin carbs, but there was talk of sending cars without engines to the US, where a Porsche 911 flat-six would be swapped in. The only surviving example has the VW engine, so it’s not clear how far along this particular option was. 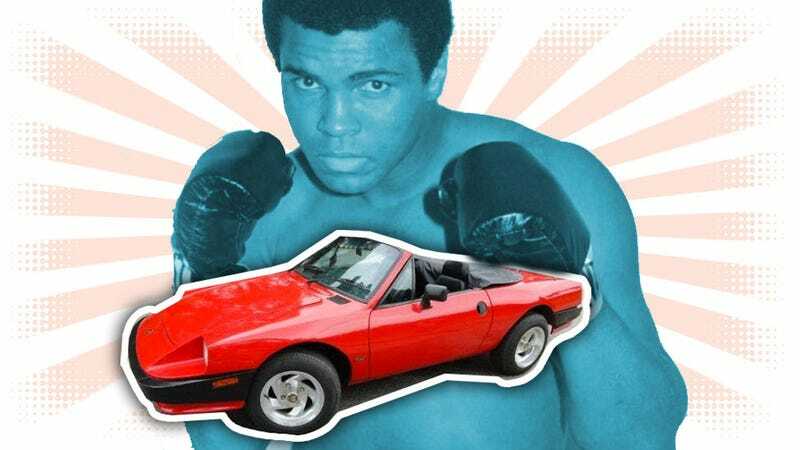 The car would have played on Ali’s involvement pretty heavily, with the official name being “Puma Al Fassi by Muhammad Ali.” Also interesting is that Ali himself travelled to Curitiba, Brazil to oversee the production of the prototypes, which might be a first for a professional boxer. Unfortunately, before any of the production cars could be built, the Sheik had all his assets frozen because of tax evasion charges, which pretty much sank the whole deal. With around $36 million invested to produce the Al Fassi, the company took a hard blow, and was forced to give up production rights of the Puma to another company, Alfa Metals, who produced the final run of Pumas in Brazil – in 2006, Pumas were sort of re-born in South Africa, but that’s a different story. It’s a shame the Sheik couldn’t pay his taxes, because a 911-powered Puma would have been pretty amazing, and any car with “by Muhammad Ali” in the name pretty much has to be badass, right? Only one prototype is accounted for, and it looks like it’s for sale, if you want to make the best purchase of your life.